2805 Clove Lane: Stunning Mid Century Style Contemporary on 1.08 acres of wooded privacy. Less than a mile to shopping, restaurants & Interstates. Best of both worlds. Vestibule Foyer entrance, presents gorgeous views of the outdoor living space. Upper level Living includes Living Room with access to decks & screened in porch, three large Bedrooms, Full Bath & Bonus Room w/ built-ins & skylight. Main level has open flow, Second Living Room with stone walled fireplace, hardwood floors & sliding doors expanding to outdoor decks. Dining Area & fully remodeled Kitchen include, wet bar butler's pantry, hardwood floors, natural cherry cabinetry, SS appliances, pantry & granite counters. Master Bedroom with sprawling views of the woods & nature. Remodeled & enlarged Master Bath with new double-sink vanity, 2 person shower, walk-in closet & second closet. Remodeled Powder Room completes the main level. Lower Level unfinished space for laundry & storage. LED recessed lighting throughout. 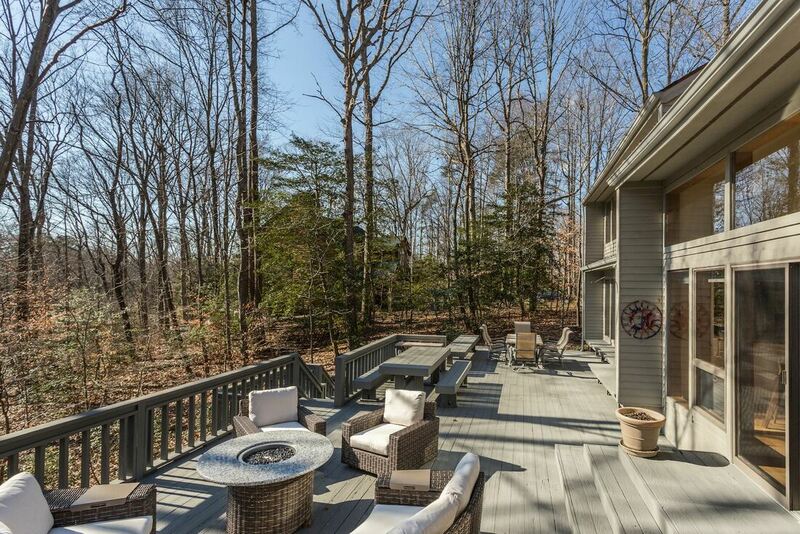 Wonderful outdoor living space to include decking with built-ins, steps to yard & screened in porch. Two car oversized garage includes workshop area. House in pristine condition. Special Financing Incentives available from SIRVA Mortgage. 3445 Newport Avenue: New price and only 10 days on the market, amazing value! Live the Resort Life All Year Long. Nature, Boating, Beach & Community. Lovely Three Level Contemporary backing to trees. Open Floor Plan, Living Room w/Fireplace to Cozy Up to on Cold Winter Nights. Flow to Dining & Kitchen, w/French Door to Huge Deck. Bedrooms on Upper & Lower Levels. Updated Full Baths on all levels. Landscaped Yard & Circular Drive. 3828 Glebe Meadow: Stunning End Unit Townhouse in The Landings of South River Colony. Steps to the pool, tot lot, tennis court. Hardwoods on main level. Eat in Kitchen & Separate Dining Area which flows into Living Room. Sunroom & Deck overlooks spacious privacy fenced yard. Walkout Lower Level Family Room/Full Bath. Huge Master with En-Suite, Walk-In Closet & Sitting Room. Visitor parking across from house. Blue Ribbon schools! 1015 Harbor Drive: Stone Front Open Flow Colonial, Large Lot with 2 Car Garage, Fenced Backyard, Hot Tub, Deck with Built-In Benches. Master with En-Suite, 2 walk-In Closets, Built-Ins & Sitting Room. Bedroom. Lower level Laundry Room. Main Level Office, Living Room, Dining Room, Kitchen & Family Room, All with Hardwoods. Kitchen with Granite, Stainless Steel Appliances, Gas Cooking, Pantry & Breakfast Area Leads to Deck. Family Room with Stone Fireplace, Speakers. Lower Level Game, Exercise,Theater. 11 Roe Lane: Broadneck High School. Brick & Shake Rancher. Approx. 1600 sq. ft. Huge Master Bedroom Addition, with 2 Walk-In Closets & Master Bath. 2 Additional Bedrooms & Full Bath. Hardwood Floors. Custom Kitchen Cherry Cabinetry with Walnut Inlay w Built-in table. Stainless Steel Appliances, Quartz Counters & New Floor. Very Large Living & Dining Areas. Two driveways. Lower Level Recreation Room. Two Sheds,1 with Power & Garden Shed. 3424 Narragansett Avenue: Corner Lot in Arundel on the Bay with views of the Chesapeake Bay. Community amenities include; Boat / Launch Ramp, Private Sandy Beach, Common Dock, Multiple Slips. 6432 Wilben Road : Brick & Stone Transitional House with a 2 Car Garage. Spacious Master & 2nd Bedroom on Main Level. Updated Full Baths with Custom Tile Work. Large Kitchen with top of the line Cabinetry, SS Appliances & Custom Tile Opens to Family Room. Formal Living & Dining Rooms complete main Level. 2 Bedrooms with High ceilings on 2nd floor with a Full Bath. Huge unfinished basement with walk out. Deck. 345 Terrace Drive: One level living at it's finest! 3 bedroom 2 bath home with Large Open Kitchen, Maple Cabinetry & Stainless Steel Appliances. Bedrooms include, Master with an en-suite, and three large bedrooms with additional full bath. You'll love entertaining on the 4+ acres of open and wooded yard. Blue ribbon schools, and conveniently located to shopping and restaurants. A must see! 7734 Moonfall Court: Great opportunity to buy into Stoneybrooke Village. Pella Door w/Integral Blinds Leading to Huge Deck Over Looking Lovely Gardens. Large Master Bedroom with 2 Closets. Two Sizable Additional Bedrooms, Neutral Full Bath. Spacious Kitchen w/Pantry & Loads of Cabinetry & Pergo Style Flooring. Huge & Bright Breakfast Area. Full Bath. LL Laundry & Recreation Room w/Drywall & Fixtures, Ready to Finish. 615 Oyster Cove: Enter this stunningly remodeled condo with breathtaking Bay views. Enjoy the serenity while sitting on your deck. Large open Kitchen with granite, SS appliances, subway tile & ceramic floor. Open flow to living room with FP & dining room. Master Bath exquisitely remodeled with custom shower, dual vanity & walk in closet. Bedroom #2 with Murphy Bed & 2nd remodeled full bath. Pool, boat slips, clubhouse. 906 Scupper Court: Stunning brick colonial. House offers privacy in cozy neighborhood backs to trees, close to DC, schools, Indian Creek and Arch Bishop Spalding, Annap. Mall . Open floor plan w/lots of light & Smart house synched, hwf, crown molding, gourmet kitchen (piped for gas), granite, Stainless Steel appliances, Family Room with fireplace, Huge master w/ sitting room & En-suite, UL laund + 3 additional bedrooms. Lower Level rec. & game room with wet bar, & 5th bedroom.